Paul Barford also noted the story and added a quote from AFP. 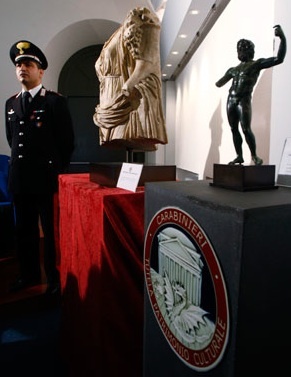 The bronze statue, which was stolen from the National Roman Museum in 1980, was sold by Sotheby's auction house in New York in 2006 and later put on display at an exhibition in Cleveland in the US state of Ohio. I have been unable to find a bronze Zeus at auction at Sotheby's in 2006. However a bronze figure of a Zeus, some 24 cm tall, with a "missing right hand" (it appears to be missing from the elbow) was auctioned at Sotheby's New York on 9 December 2004, lot 249. The Gods Delight: The Human Figure in Classical Bronze, Arielle P. Kozloff and David Gordon Mitten, eds., catalogue of the exhibition at The Cleveland Museum of Art, November 16th, 1988 - January 8th, 1989, the Los Angeles County Museum of Art, February 9th - April 9th, 1989, and the Museum of Fine Arts, Boston, May 9th - July 9th, 1989, Cleveland, 1988, no. 29, pp. 168-172, illus. At the time of the Cleveland exhibition this Zeus was the property of Mr and Mrs Lawrence A. Fleischman. The Fleischman statue had appeared in the Search for Alexander exhibition at The Fine Arts Museums of San Francisco in 1982. It was published by Joyce Geary Volk ("A Lysippan Zeus", California Studies in Classical Antiquity 3, 2  272-83) who reported that in 1984 the Zeus was the property of Edward H. Merrin: "Mr Merrin purchased it from a dealer who had obtained it from a Swiss collector in the late 1960s".